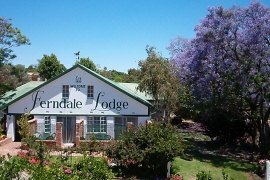 Ferndale Lodge offers comfortable Bed & Breakfast accommodation in private and secure chalets, all en-suite and with their own entrances. Close to Randburg CBD and only 10 minutes to Sandton's CBD, Monte Casino, MTN Sun Dome, Fourways and Cresta Shopping Centre. Your host has traveled extensively throughout South Africa, both on business and pleasure. "In recent years I have become increasingly aware that, for the business person especially, the cost of a good night sleep has escalated exorbitantly. These costs can even prohibit a business trip or training session. With this in mind, I have created a value for money establishment close to Johannesburg's northern business hubs and amenities." Ferndale Lodge has 3 Stars on the SATOUR Grading system, 3 Crystals on the SABS Grading system, is an Associate of the AA Quality Assurance Program and a member of the Guest House Association of SA (GHASA). The rooms are all equipped with fridges, microwaves, extra crockery and cutlery, TV, tea/coffee and en-suite facilites. They have their own entrances from a patio. There are braai (barbecue) facilities in the gardens. The double / twin / family rooms have single or bunk beds as well as a double. There are beautiful gardens with a swimming pool. There is plenty of "off-street and out-of-sight" parking. The conference room can accommodate up to 45 people depending on the seating arrangement.